On occasion, it's the day-to-day activities that mean the most–the tiny stuff. 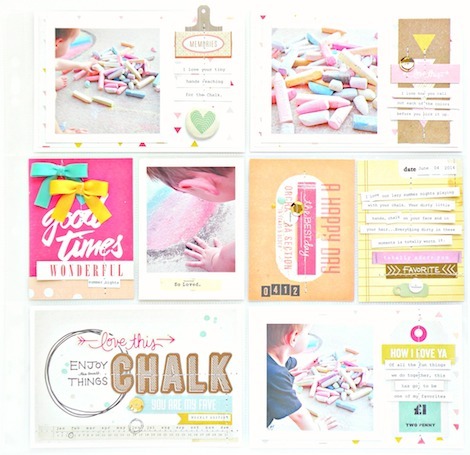 CP Gal, Stephanie Buice, introduces a fab, easy way for documenting such moments using traditional pocket-page scrapbooking & the Notes & Things collection. Pocket style scrapbooking is so much 'me'. It's always a nice change of pace to work with smaller sized cards vs. the regular 12 x 12 pages. I usually work on my project life album once monthly, but occasionally, when I'm in a scrapbook rut and want to change things up a bit, I pull out a divided page protector and let the ideas flow. Instead of doing weekly or monthly spreads, sometimes I prefer to document just one activity or event on a spread. It's fun to create multiple little mini pages from various cards. It allows me to experiment with new styles/ techniques before jumping into using them on a full sized layout. I find it easier to print the journaling and then sew it onto my cards. I like the 'cut and paste' feeling it adds. I like the title card to stand out a little bit more, so I emphasized it using multiple embellishments and a clearly defined title. The Notes & Things collection color palette went perfectly with my pictures. All the bits and pieces leave you with so many options for dressing up your cards. Lately, I cannot get enough of the little garland bows from the Oh Darling collection. Even though this layout is about my son playing with one of his favorite things, I tried to use them in a way that didn't scream "girly". If you're a project life'er like myself, I highly recommend creating an 'everyday' spread such as mine. By documenting just one subject, it simplifies the creation process and the page is quickly accomplished. Melissa Phillips' mini pockets are the sweetest creations we've ever seen! 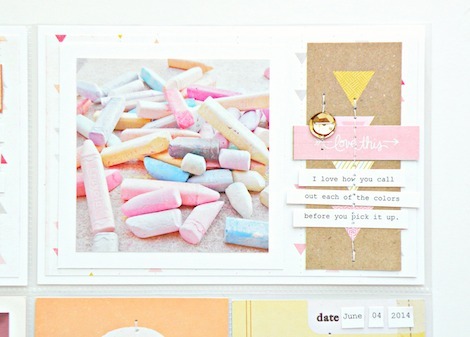 Tucked with tags and decorated with Notes & Things Chipboard Frames, they are sure to perk up a colorful idea, or two! Hello Crate Paper lovers! Melissa Phillips here with you today sharing a 'Crate Colour' project. I love letting color inspire me, it's one of my most favorite starting points. The new Notes & Things collection is packed with lovely colors, from soft and subtle, to juicy and vibrant. My projects were inspired by the colors found in the photo above. I began with some 12x12 Notes & Things double-sided patterned paper and my favorite pocket die, with the idea of creating a few pocket notes with tags. I love that the paper is double-sided so that you catch a glimpse of the fun patterns and colors on the inside of the pocket as well as the outside. After assembling each die cut pocket, I started embellishing the front using elements from Notes & Things like Chipboard Frames, Mixed Tags, and Standouts Layered Stickers. I wanted to create some scrappy dimensional bows to embellish my pockets so I pulled out my Styleboard dies and created a few to add some character and personality. I dressed up the center of each using things like trim and sequins, a staple, button, etc. I used vellum behind each chipboard frame in order to soften things up a bit, and also because vellum is such a beautiful and versatile element. I used Notes & Things Cardstock Stickers Kraft Label Stickers to embellish my pockets and tags as well as Styleboard Gold Label Maker Stickers. Little touches of gold add so much charm. A few Love Notes Badges were also used along with one of my favorite finishing touches, the dots from the Wisecrack Gold Glitter Thickers...so much fun. The Standouts Layered Stickers are so sweet. Most definitely one of my most favorite Notes & Things products. Another favorite Notes & Things product are the Kraft Label Stickers. I love the sweet and simple messages they carry. These graduation gifts from CP Gal, Jeanette Lee, were created exclusively for her high school students. They include personalized pens, prim and proper pockets and multi-layered tags from Crate Paper collections, old and new. They are stunning! As some of you might not know, I am a high school teacher in Singapore. Every year, I prepare personalized gifts for my students who will be graduating and sitting for their major examinations. This year is no exception. Even better, I have been blessed with a class filled mostly with girls. Hence, there was no hesitation in creating these tag pockets to their prettiest state. 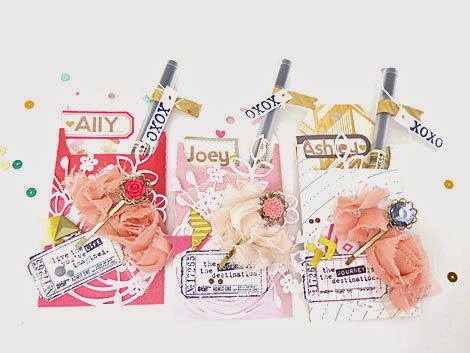 My first batch of tags showcase an array of repetitive elements such as delicate floral die-cuts and ribbons. The intended goal was to create heavily textured tags using multiple layers of various product, flowers and ribbon included. I also added smaller embellishments, a stamped sentiment and a personalized name-tag for writing words of encouragement. Each student was also to receive a personalized pen. The simple process of combining Maggie Holmes' decorative tape and a sentiment attached with white string, makes an average everyday pen look more glamorous. To break the monotony of the previous design, I started a second batch of pocket tags. This time around, I focused on phrases and sentiments. I dug out sentiments from prior Crate Paper collections, and layered them over and under each other. Not forgetting the floral die-cuts and ribbons, the tags were complete. Given the sheer number of tags I had to create, I was able to save some time by using similar elements throughout. It made the process of creating 'quicker', and more enjoyable. In the end, each tag was somewhat similar yet different, befitting of how every student is different in their own way as well. Ultimately, this was the outcome I was hoping for. Thanks for having me here, today. Have a splendid weekend! This simple, easy-to-make apple card montage is absolutely darling and a near perfect gift for a teacher on the first day school! 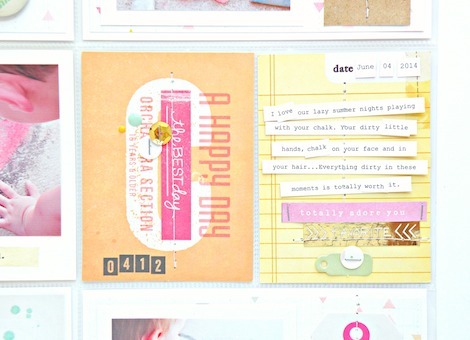 Each card encompasses tidbits from the Crate Paper collections, Oh Darling & Love Notes. August is just around the corner and it's time to start thinking about back to school–YIKES! This year, I thought it might be nice to give the teacher a stack of simple 'Thank You' cards that she can use throughout the year for whatever the occasion. I used a single sheet of 6 x 6 paper from the Oh Darling collection to create the tag and layered it on a journaling card. The paper looked like a school writing book, so the collection is not JUST for Valentine's day! This is a simple way to get a layered effect for those of us who are layered challenged...(use a journaling card and another shaped smaller tag on top). The 'thanks' sentiment was made using a single 6 x 6 sheet of paper from the Love Notes collection and another die. I liked how the hearts were still able to peek through the lines of the word. I left the negatives in for a more edgy vibe. It gives you a better look at the patterned paper, too. A few pop ups, twine adhered with a staple and I was done! This card set was easy to reproduce using an assembly line technique! I was able to get three cards using a single 8.5 x 11 sheet of paper. Easy, not a lot of fussy cutting, gluing or coloring on this project–just cut and glue! CP Gal, Lisa Dickinson, is sharing an added bonus in honor of our Pretty Things theme–sun, sand and surf; two free 'Cut Files' alongside two awesome beach-loving layouts! To download them, simply click on the words highlighted in BOLD noted in today's post. The warm summer weather is inspiring me to scrap my beach vacation photos from Spring Break this year–I love revisiting the memories of the sun, sand, and surf! But summer scrapping for me has to be pretty fast and simple–there's just not a lot of time to spend at the scrap table. My secret for a fabulous summer page without too much fuss? Layers...lots of them! Multiple layers add depth and dimension to your page without being time-consuming to arrange. On this layout, I began by adding a layer of vellum cut on my Silhouette into a Sunburst. I stitched the rays to my background photo, but if you don't want to mess with sewing, use a pen to draw stitches or just skip it altogether. By adding this base layer of vellum, I've already created an area on my page for the focal point–the center of the sunburst. I used scraps of papers from the Open Road collection, adding in a pink polka dot from the Oh Darling line. The soft aquas and yellows are perfect for beach photos, and the pink helps add a bit of contrast. 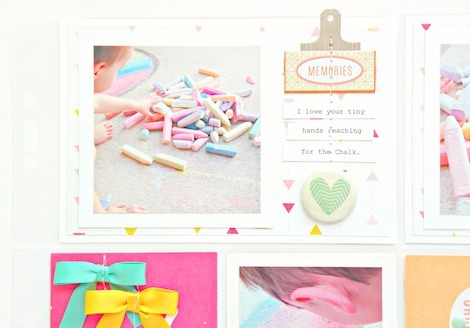 Layering together papers is a great way to use up scraps, too! I also selected chipboard and die cut accents in similar colors that add curves and non-linear shapes to my design. I've written my journaling on a card that tucks behind the paper grouping. To keep the card from sliding too far underneath the map paper, I used foam squares and created a small pocket that it can slide into. As a final layer, I've added metal flair, stickers, wood veneer and a die cut title, all which add texture and interest to my page. By simply building up many layers of supplies, I've created a detailed page that looks like it took longer than it actually did! Here's another page that also incorporates lots of layers. I've used them to help reinforce my page theme–the ocean! I began by selecting papers that coordinated with my photos–tones of aqua and soft green from the Love Notes, Open Road, and Oh Darling collections. Then I die cut a Wave Border from three of them and layered them across the page, securing them at the bottom with a few rows of stitching. Because I wanted the colors and texture of the page to give the impression of the ocean, I printed my journaling on vellum and layered it over the bottom two-thirds of the page. This helps softens the colors underneath and adds a layer of translucence much like water. It's also an easy way to add journaling anywhere you want on a page without covering up any page elements. The title is a combo of Thickers and a die cut word, all in colors that tie back to my photos and the watery feel of the page. Mixing up several fonts, sizes, and colors makes for an easy and interesting title without a lot of work. For a final touch, I added some stickers and chipboard to the upper edge of the page. Layering a few blue and black elements here makes a visual connection with the photos and title and leads the eye through the whole page design from top to bottom. So, if you're short on scrap time this summer, try layering up lots of elements for a detailed result that doesn't take much effort. Happy Scrapping! As soon as I saw our assignment choices, I knew right away that I wanted to make a mini album on behalf of this month's 'Crate Petite'. I've been itching to gather pieces from here and there throughout my Crate goodies and pull them together somehow - this was finally my opportunity. Because my pieces were from an assortment of various Crate Paper collections, I wanted to lease a small base for my album to help unify them. I used one piece of 12" x 12" cardstock cut into three strips that measure a total of 4" x 6". The six inch length was a little too big for me, so I trimmed them all down to 4" x 5". I folded each piece in half, placed them together and sewed down along the crease - it was pretty easy. The 4" x 5" size was the perfect fit! It allowed me to use the journaling cards with varying layers. I wanted this mini album to be personal - one that to someone else might seem like pretty pictures, but really is a story from my heart. 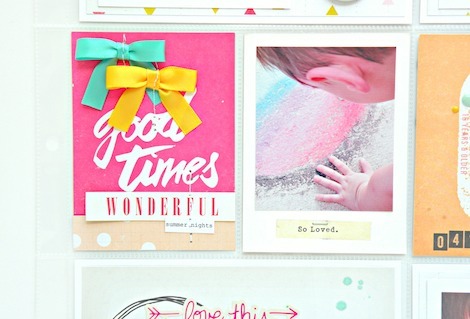 This mini is filled with little snippets of my son that could brighten up any day. I used lots of journaling cards and this particular one left the perfect space for me to add a bit of my own journaling. On these pages, I started the mini with a favorite picture - us holding hands when he was almost six weeks old. This picture reminds me that although he's super tiny, him and his little hands are one of the biggest and best parts of my world. How could that not make me smile?! I added some patterned paper from the Love Notes collection and a doily under the picture to tie it in with the page above. I kept it simple by allowing the picture to tell the story. When I look at this picture there is no denying who this boy's mommy is. As he has gotten older, he resembles my husband a little more, but still looks very much like me. Not only in his looks, but in the little things he does, I see myself. This can be very humbling at times, but there is no doubt that he's definitely 'my kiddo'. This journaling card from the Boys Rule collection helped me to tell my story. I used patterned paper as the base and added other elements on top. The paper tape from the Styleboard collection found it's way onto many of my pages - it, too, helps pull it all together. I love the journaling cards and emphera pieces from each of the collections. For these pages, I started going through them and pulling out pieces that I knew I wanted to use. I worked almost exclusively with the Styleboard collection. I mixed patterned paper and journaling cards just underneath the photos. Then, I sewed here and there, and embellished the pages with stickers and a badge from Love Notes. Although the pictures on these two pictures are a near perfect match, I still preferred to use the same papers and colors to tie it all together. I added my picture on top the papers and then the 'happy' sticker and 'boy' letter Thickers as my page title. I stapled the Thickers down to give them a more masculine feel. I know that pink is traditionally not a boy color, but I like the softness that it lends to my photos. In this top page, my son was about one year and it was his first time using crayons. We had such a fun time and he loved it. I loved giving him a new way to express himself. Looking at these pictures 'now', the pink does look a little girly, but I'll just tell him it's because he's momma's boy. This is a more recent picture of my little guy. At this point in his sweet life, he likes to rock in his chair with his bear, sing songs and tell me stories. It's usually how we start our day and one of my new faves! When I was picking out embellishments to use, I set aside these triangle studs - I like how they're soft, but yet, still edgy. They really help to add dimension to an otherwise flat last page of my book. This was such a simple album to put together - so much so, that it can be created by any level of scrapbooker. Since I usually shy away from making mini books, I was pleasantly surprised at how quickly this one came together. Because the pages are attached, my only struggle near the end was when I was trying to figure how to photograph them. I opted to prop them up on a white board and captured them as shown. It's a definite must-try mini album filled with lots of love! My Honey and I are college sweethearts. I knew right away that he was the one. This picture of us was taken on one of our first dates almost twelve years ago, and since then, my heart has grown more in love with him each and everyday. He really is my Forever Valentine. For this layout I used embellishments from the Love Notes collection - pulling from here and there to create little scenes of each of my six squares. Grid layouts are my favorite to create because I get to decorate each square on it's own while using it to tell pieces of a story. When I look at this picture of us, I can still remember that feeling of butterflies in my stomach. I had met my prince charming and I knew it. I can't get over how young we look. We were only eighteen! Although I made the six squares the focus of my layout and meant for them to be closely grouped together, I wanted them to all be different, but carry the same feeling. Again, to keep all of the squares similar in style, I used doilies on three of them to tie them together. I placed them in a triangle pattern to keep the eye moving throughout the page. What doesn't say Valentine's Day like a bunch of heart doilies?! Originally, I had planned to journal much more of our "love story", but space just didn't allow for it. Because I was working with three inch squares, I decided to keep my journaling short and sweet. It ended up telling the perfect amount. I used a black and white photo on this layout to tie in with the black chalkboard elements of this collection. I really like the addition of black for a Valentines theme. I also used little pops of black in each of my squares to ground them. To me, there's just something special about what a little bit of black can do to a design. Using this old picture of us is a great reminder that I need to take out my camera more to capture "just us" and our journey. Our love is a rare gem these days and is totally worth documenting. Most of you know me by now, and you know that I'm up for any holiday that gives me a reason to do a photo shoot…I seem to love the "cheesy" holidays the best. Things went a little crazy here this year, and instead of our normal Valentine's Day with special photo shoots, we have had one ice storm, snow storm or blizzard after the other. The kids didn't go to school on Valentine's Day. I wasn't really able to get out of the house to get my last minute treats, and things just didn't go as planned. We did however, still make the best of it! We did Valentine red velvet cookies, went sledding, and had pancakes with strawberries for breakfast. I did have some vintage Valentine signs I had picked up while antiquing. I threw some of them up, and hoped the girls would cooperate for some photos. And I was a happy mama, because in the space of five minutes, I got some super cute photos. I even got a photo of the candy the kids got from their Sunday School teachers before it was eaten! The Love Notes collection has the most amazingly cute stamp set, and part of it includes nine small stamped sentiments, which was exactly what I needed! I was so excited, so I stamped a sentiment under each of my patterned paper and stitched lines between the polaroid frames to make them stand out even more. I embellished the collage with some chipboard stickers, flair, and a punched heart. I then started layering my elements to the left of my collage. I cut the chalkboard sentiment from a journaling card, tucked the LOVE Bingo journaling card beneath it, and then added a doily and standout sticker to the top. The pink heart on top of the standout rosette sticker didn't really match the rest of my layout, so I layered another chipboard sticker over it. I really, really love the standout stickers. They are really soft and make a major impact on a layout with minimal effort! I have been so pleased every time I use one on a layout. Also, the journaling card set doesn't disappoint! I use my favorite ones on layouts, and then the rest in my project 365 pages. When I made the photo collage from my photos, I found that the rest of the layout came together rather quickly. The collection is just so beautiful that you will be able to use it not only for your Valentine's photos, but also, on many types of projects. I hope I have given you some inspiration to scrap your Valentine photos quickly and beautifully with the Love Notes collection. Thanks for stopping by today! "Remember the year you didn't get me anything for Valentine's Day?" This line begins a story that no wife should ever have to tell or retell, a story that husbands across the Valentine's Day-celebrating world fight to avoid becoming the antagonist in as they clamor at the last minute for chocolate, for flowers, for cheesy cards, for shiny baubles, and for impossible-to-attain reservations. Alas – my Valentine's story this year starts just this way, though luckily, it all works out in the end. This layout tells the harrowing tale. Yes, after an exhausting week, my husband did, in fact, overlook Valentine's Day this year, but he made up for it one day later, gifting me with the usual Valentine's tokens of affection, plus a few more that let me know that he not only loves me, he also gets me. I may be a girl who likes getting pampered, but I'm also a scrapbooker, so after expressing my surprise and my delight, I couldn't deny my scrapper's instincts – I grabbed my camera and snapped a few shots of my post-Valentine's Day haul. Together, they help to tell the story of February 15th Valentine's Day. Rather than just pick one or two that I liked for the layout, I decided to use them all, sizing each one down to 1.5" x 2.25". They are all part of the story, after all. 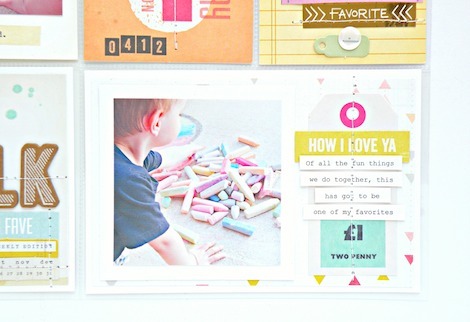 To create the layout, I layered strips of patterned paper from the Crate Paper Love Notes collection across the page, and added several Love Notes photo overlays to the mix. The two red lines across the block of photos (from a red transparency frame) actually help to guide the eye across the photos, simultaneously unifying all three columns while also creating a distinct center column. I also trimmed a few more frames and backed several of the photos with them, creating photo mats with a subtle colors that blend well with the existing colors on the layout. Among the photos, I tucked in accents, including assorted Love Notes cardstock and chipboard stickers, a foam heart from a sheet of Love Notes Thickers, metal flair, and a painted-hearts clothespin. Interspersing these accents across the photo block creates visual continuity among the individual photos. Adding them to different layers – over and under photos and paper – results in a dimensional "boost" in a few areas but also makes clear that everything on this page is linked by love. Usually I come up with my own layout titles, but a sticker from the Love Notes collection sparked an idea. Initially, the sticker read, "a love story", and when I set eyes on it while selecting the supplies for the layout, my first reaction was to laugh, thinking, "Sure, yeah…a love story – but one day late!" Just like that, there it was, the idea for the title. I used the (free) font Typenoksidi at size 18 and typed the words "one day late", and after printing out the phrase, I drew lines around the printed words so that I could determine where to place the sticker to ensure that the text would align with the lines on the sticker. After placing the sticker over the printed text, I ran the sheet through the printer once more, and after a short bit of drying time to prevent smearing, my title was ready to go. I added it to the mix of accents and layers so that it joined in the overall "flow" of the page. After assembling the photo block and it's layers, I printed the journaling on a sheet of "Sparked" patterned paper, a paper that works not only because the colors complement the existing colors on the layout, but because the horizontal stripes mimic those created by the horizontal rows in the photo block. The subtle background does not upstage the journaling, and allows ample room so that the whole story can be told. The final touch was the addition of the word "love" at the bottom of the page, accompanied by a few more hearts, and the adjustment of the "February 14" date to February 15. Even the tiniest of additions can help to tell a story – and make clear that I've definitely found the humor in the Valentine's Day that almost wasn't. So there you have it, the tale of the time I didn't get anything on Valentine's Day, and it still managed to be a wonderful holiday all the same. Before getting started with another round of inspiration, we first want to take a moment to thank those that came forth with a response to last Friday's giveaway question. We inquired as to why the many of you visit the Crate Paper blog and after surveying your thoughts, it appears the two most common responses were "because I love the style of your designs" and "your a great source of inspiration". How awesome is that?! Thank-you everyone for chiming in and telling us your reasons for hanging with CP! We sincerely honor your feedback - to put it simply, our fans are the BEST! February is definitely the time for love in our house. My husband and I celebrate our wedding anniversary on February 12 and, of course, Valentine's Day comes on the 14th. We have been married for 14 years now and each and every year, he brings me roses to celebrate the two events. It's a tradition that I love and look forward to each year. I decided to create a layout that featured this year's bouquet. I chose to use a clothesline/banner design on this page. I wanted to be able to feature lots of the fun embellishments in the Love Notes collection and thought that this would be a great way to do so. I started my page by sketching two diagonal lines so that I could see where to place my elements. I added the photo first and built the rest of the banner around it. I knew I wanted to use a bunch of the cute clothespins. The large ones had hearts on them that faced sideways. To make them work on this page, I simply popped them off and added them back on with glue dots. It was super easy and they look just right now. Next, I began placing the embellishments where I wanted them to be. I chose florettes from the standouts, chipboard pieces and smaller clothespins. As I placed them onto the 'banner', I layered them a bit to fit them in and to achieve the look I was going for. Once the first row was finished, I started the second. I knew that I wanted to include my title and journaling block here. As you can see, I used the chipboard banner pieces to spell out the title. Using the word 'love' sideways added some visual interest. As I was trying to figure out how to add the journaling, I spotted the packaging for the clothespins lying on my desk. I knew it would work perfectly! All I had to do was trim it down and round the bottom corners. I adhered all of the elements into place. Finally, I cut some twine and spread it across, attaching it to the clothespins. This was much easier than trying to attach the elements to it and keeping everything in place as I did so. I love how the layout reflects a feeling of fun and celebration - exactly how my roses do. They are my favorite tradition from Valentine's Day and I know that they will continue to be for a long time.